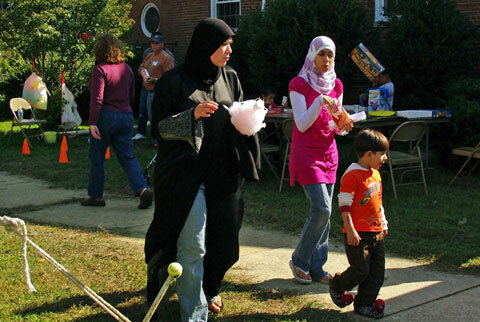 Guests of different faiths attend the Back to School Fun Fair hosted by Springfield United Methodist Church in Virginia. 2010 file photo by Kurt Krieger. Back-to-school season is officially here, with many students returning to class in early August. For many United Methodist congregations, it’s a time to share God’s love in both word and deed. 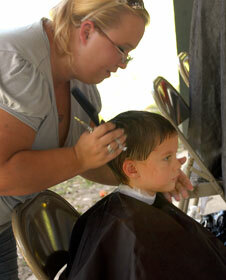 In Pace, Fla., Wesley Memorial United Methodist Church hits the ground running with the Santa Rosa County Back 2 School Bash, scheduled this year on Aug. 17. “The B2SB,” said the Rev. Mark Dees, “is an outreach ministry of the church in partnership with our neighboring church, along with 140 businesses and organizations in our community. In 2012, we gave out 1,700 bags of school supplies, 300 backpacks, 140 haircuts, eye care, child video identification and around 75 door prizes.” Between 7,000 and 8,000 people attended. Various faith-based organizations set up booths to spotlight their work. “I guess you could say that the people of the community know us as the Back 2 School church,” Dees added. “It’s about showing God’s love. It’s about giving the children an opportunity to hear the message of Christ while experiencing his love firsthand. The Barnabas Connection, an outreach of the Wimberley (Texas) United Methodist Church, addresses the health and human service needs of the community through education, advocacy and direct service. One of its big events is the Back to School Fiesta, introduced in 2006 and next slated for Aug. 17. Many area churches and agencies play key roles. Underserved families receive free backpacks and school supplies, books, gift cards for shoes, haircuts, immunizations and vision screenings, as well as information about housing from Habitat for Humanity and voting from the League of Women Voters. “It’s an opportunity for this community to really get to know all aspects of the community,” explained Barnabas director Vicki McCuistion. “People don’t realize there are people in our community who are struggling. We often hide that demographic. An important aspect of the fiesta is inviting families who receive services to return next year as volunteers. McCuistion expects about 500 participants at the three-hour event. Starting in late August and continuing throughout September, Springfield United Methodist Church in Virginia, a faith-based partner of a neighborhood elementary school, plays various back-to-school events to a crowd of 200. “In addition to year-round tutoring,” said Shana Barr, director of family and children’s ministries, “our congregation participates in the school’s Back to School Fun Fair, where we pop popcorn and hand out pencils and information about our ministries and upcoming Blessing of the Backpacks and More Sunday. During this service, children and parents are invited to worship with us to receive a special blessing for their school, work or play. Later in September, we collaborate with the PTA to have a Back to School Movie Night. “People in the community look at Springfield United Methodist Church as a place to belong,” she added. “They may be of different faiths, but they know that the people who tutor their children, pop popcorn and supervise moon bounces at fall and spring festivals are people who love their children and love their family. I have seen Muslim families praying in our festival prayer tents. *Dunlap-Berg is internal content editor, United Methodist Communications, Nashville, Tenn. Comments will not appear until approved by a moderator, which will occur at least twice daily. Please keep your comments brief. Avoid personal attacks and do not use inflammatory or demeaning language. See our Comment Policy for more information.